I am in that odd sort of limbo time just before I leave on my trip to the US. There’s not enough time to really get my teeth into a new project, yet too much time to sit about idle. I finished the two red panels that will accompany my black and white ikat piece and couldn’t resist mounting all three panels on beams to see how they look together. You should just be able to make out the red-on-red warp floats in the panel on the right. 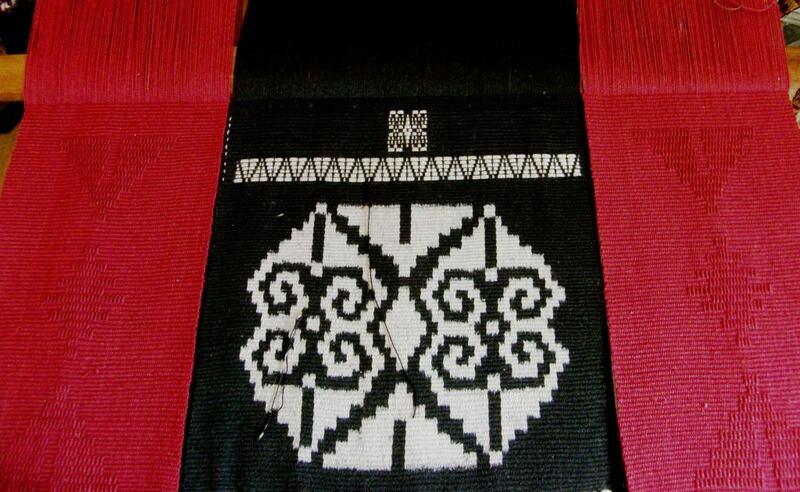 The pattern resembles the stepped pyramids and stepped diamond in the center of the ikat motif. So, between packing, cleaning and tidying up, I roam the internet taking advantage of the fact that I paid for a whole month of internet and can use my entire monthly allotment of megabytes in half the amount of time that I would normally have. I look at sites and videos and bookmark the pages which give me inspiration and ideas for future projects. And, because I really cannot stay away from the loom, I have been weaving some small gift projects. You will guess what from the title of this post…bookmarks. Bookmarks are fun fast projects. 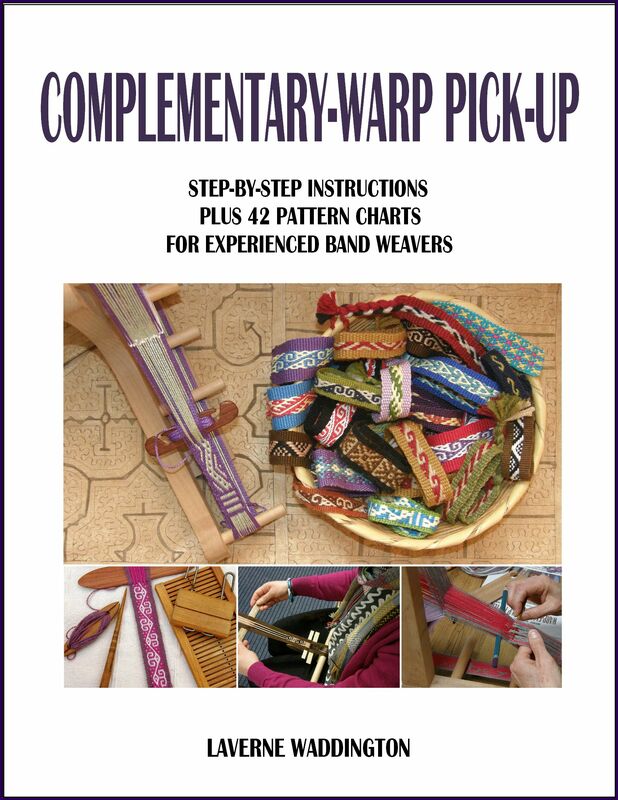 If you have a way of creating really short warps, they provide a nice way to use up small odds and ends of yarn. 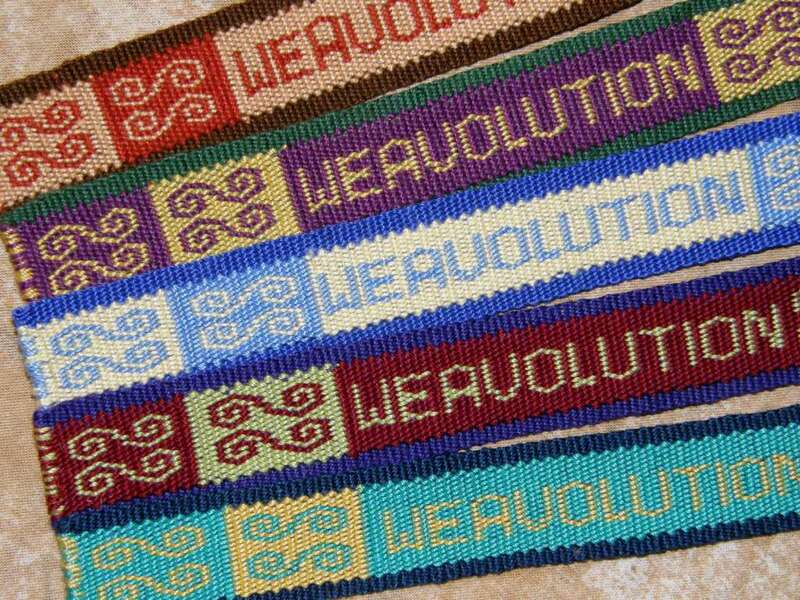 I had some DMC thread left over from my Shipibo-inspired wall hanging and so, I wound a short warp and decorated the bands with silk supplementary weft. 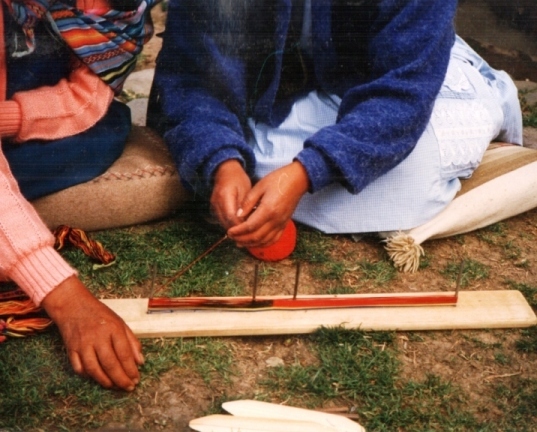 Warping for short bands with a board and nails in Huancayo, Peru. At first I thought that the plastic might look tacky but I am actually quite happy with the finished result. The plastic sleeves have a hole punched in the top through which I could thread a pretty blue braid. 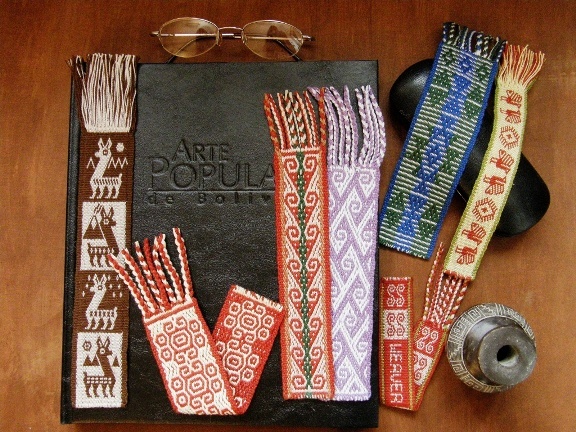 Now I want to get more of those sleeves into which I can place the Guatemalan pattern bands that I made ages ago. 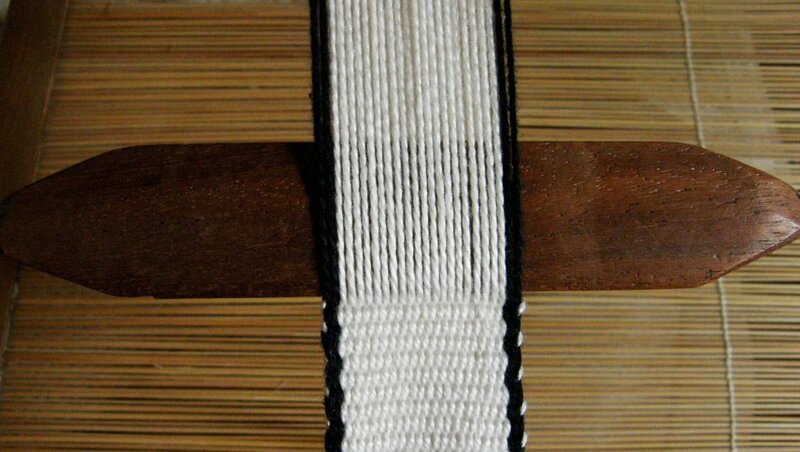 You can also see in the above picture the silk bookmark in double weave that I made for my nephew. This has become a sample as I want to redo it with the phrase all in one line rather than split into three. 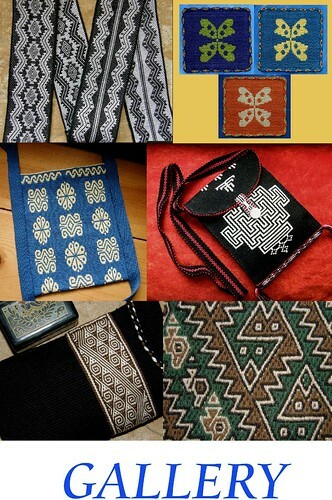 In years past, when I made long trips through Bolivia and Peru, I would take along bookmarks that I had woven to give to fellow travelers and to people who had been kind and helpful. They were a big hit and people wanted them even if they didn’t intend to use them to mark the pages in a book. 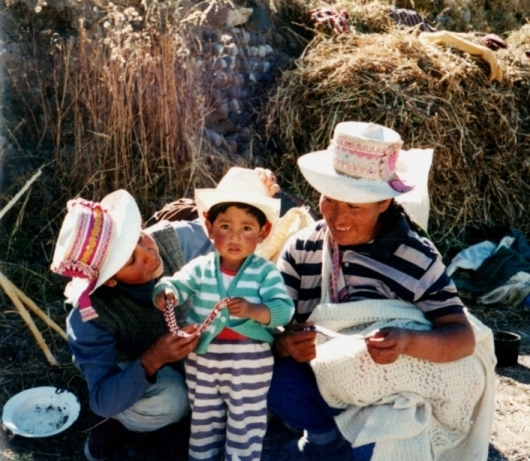 These ladies and the little fellow are members of the family of my sling braiding teacher in Peru. That little guy holding his bookmark must be a young man in his late teens by now I would imagine. 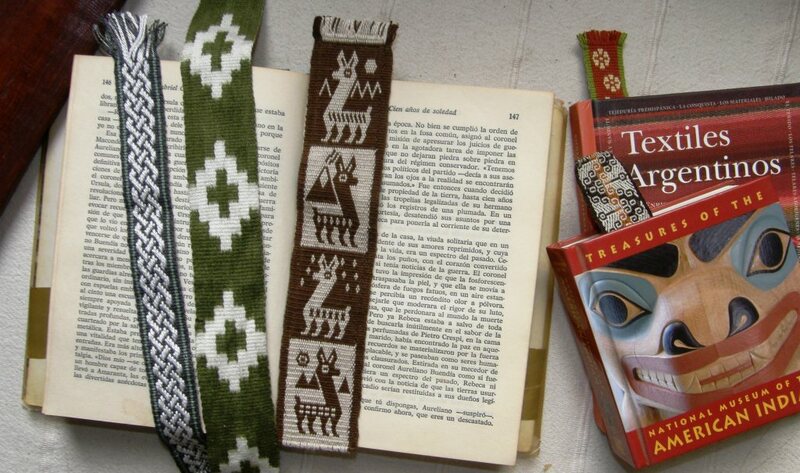 I wonder what became of his little woven bookmark. I would like to get back into the habit of having a collection of bookmarks on hand when I travel to give away. I think I should set myself the goal of weaving two a week . These will make nice on-the-road weaving projects. 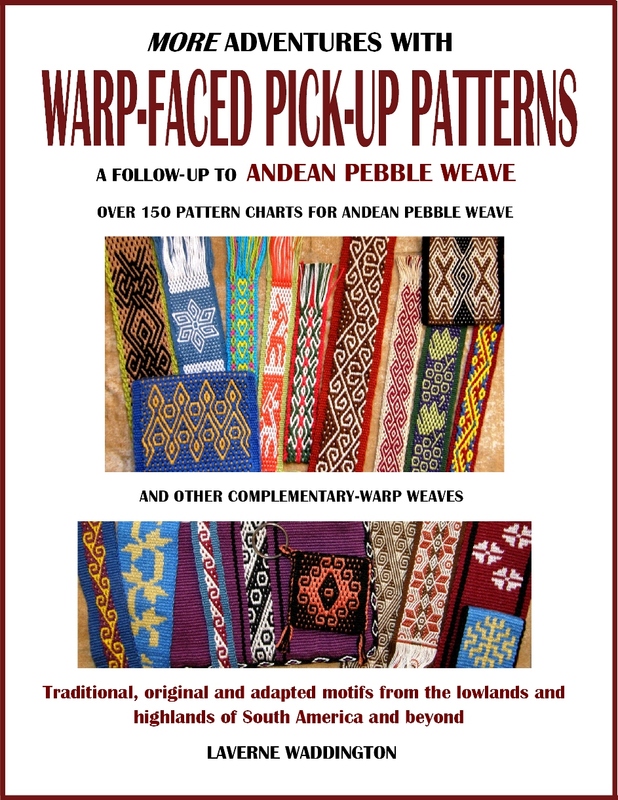 I have all kinds of sample bands lying about here at home that would make decent bookmarks…ikat experiements, supplementary-warp bands, double-weave pieces as well as complementary-warp samples made with sewing thread. I still have the good ol’ llama band. 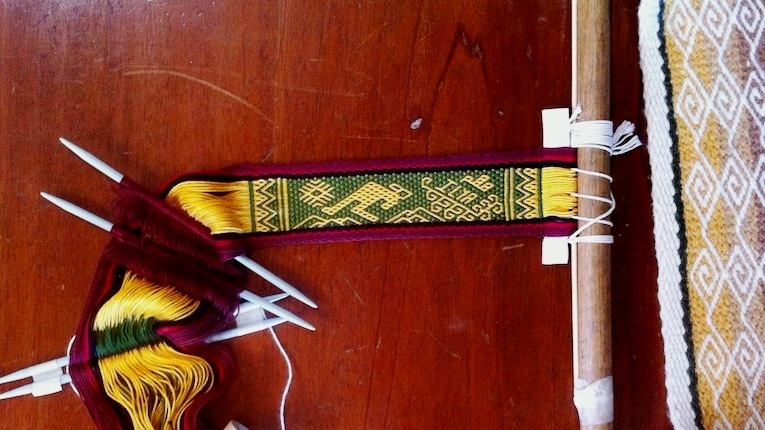 That little llama motif appears on some double-weave belts that are sold in the central highlamds here in Bolivia. I adapted and embellished it for my bookmark. 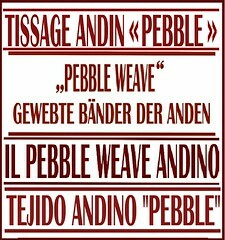 Andean Pebble Weave can be cleverly used to create letters as well although not with as much flexibility as double weave. Father Kyriakos just sent me a picture of his latest rendition of what I have named the Kyriakos Kangaroo. 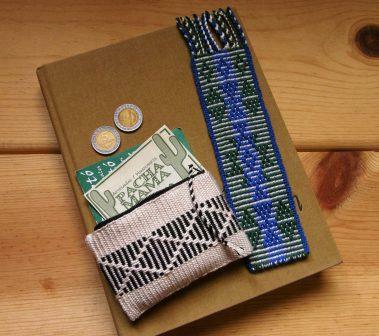 He has modified the motif and woven it into a bookmark along with the name of its new owner…Ilya. He’s also using a pebble weave backstrap, the design for which was created by Julia. Father Kyriakos has chosen to have fringe at both ends of his bookmark. My latest bookmarks in their plastic sleeves also had fringed ends but I didn’t like the way the fringes lookedwithin the plastic sleeves. I cut the fringes right off and painted the edges of the fabric with diluted white glue. I was then able to turn the edges over. The glue-soaked cloth was stiff and it was like folding paper. It gave a nice crisp, neat crease. 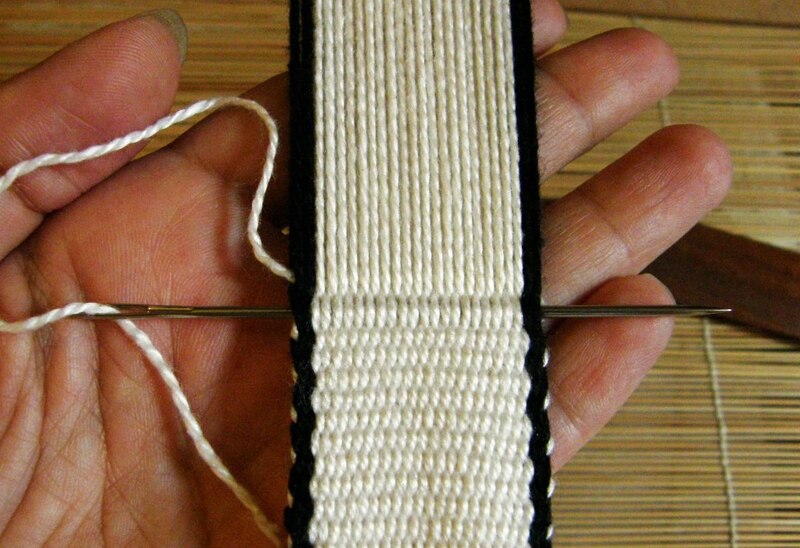 Other times, I have chosen to start the bookmark with a selvedge. 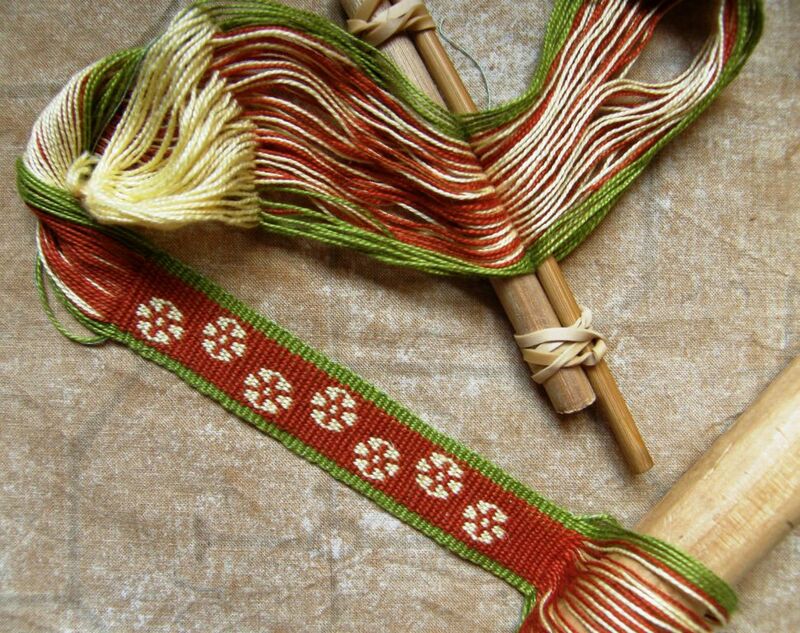 I place a fine metal rod…as fine as a “0000” size knitting needle for fine thread…within the warp and lash that to my loom bar. This enables me to start weaving right at the very start of the warp. Later when I remove the needle, I can fill the gap that it leaves by threading the tail of the first weft shot onto a needle and feeding it into the gap. Weavers in South America, of course, do not use any kind of metal rod…that is just one of my own quirky things. 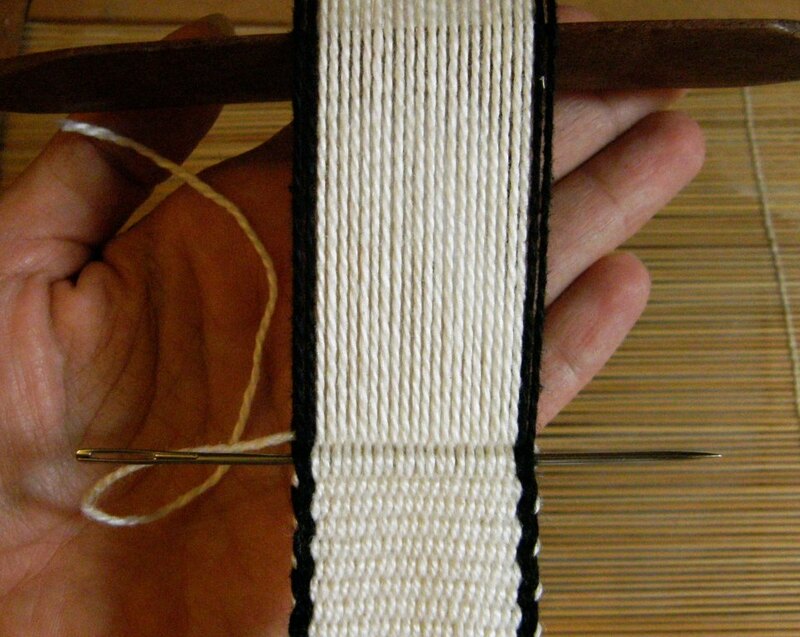 Using a fine knitting needle at the start of the band and finishing by passing the weft tail on a tapestry needle to fill the gap. As for finishing the other end of the bands, I usually choose to braid the ends. A four-strand round braid is my favorite. This secures the last weft shot. If I want fringe, I hand sew across the woven end making sure that I catch the last weft. Hand stitches can be pulled and embedded so that they are virtually invisible. I have just passed the weft for the second last time. It has been passed through the shed from left to right. I have placed a tapestry needle within the shed. I have opened the next shed, beaten, and passed the weft from right to left. This is the final weft shot. Now I need to secure the weft. I have threaded the needle with the weft and will pull it through the shed. I take it about three-quarters of the way across and then pull it out of the back of the band. The tail can then be cut. I have beaten well again in the last open shed so that you can’t tell that there are two shots of weft together in the second last shed. You will see the odd weft turn on the left hand side where the weft has traveled “backwards” into the shed on the tapestry needle. If my weft color matched the border, as it normally does, you would not notice this at all. For this demo, I have chosen a contrast color for the weft. To finish, I like to open one more shed and beat just to enclose that final weft shot within its shed. I’ll copy this little tutorial to a new FAQ page. 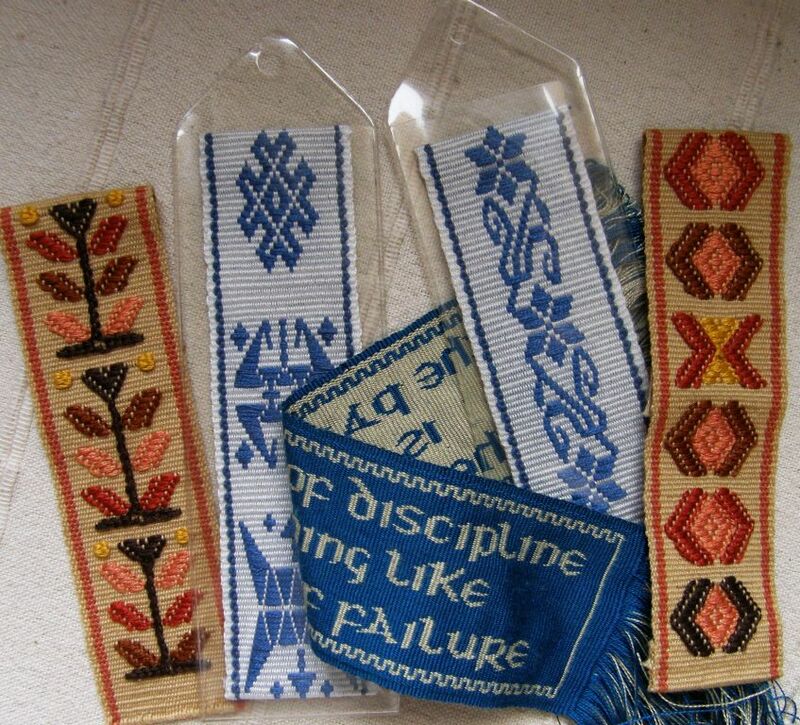 So, I have just under a week to weave some more bookmarks. I have lots of fine thread and will weave them with all kinds of structures. Having them in the plastic sleeves will be a nice way to showcase the different structures I have studied in South America and Guatemala. I am looking forward to trying some of the fine Guatemalan naturally -dyed cotton that I got at ANWG last year. This will most likely be the last post before I hit the road. I will try to write short postcard-y posts as I go and not let things accumulate too much. 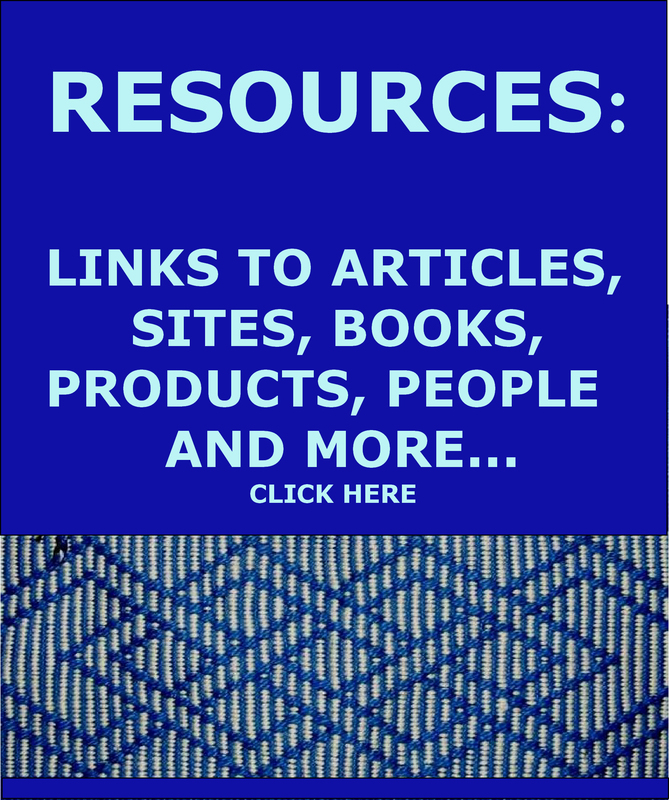 Do you need sources for the plastic bookmark sleeves? I can help with that if you do. 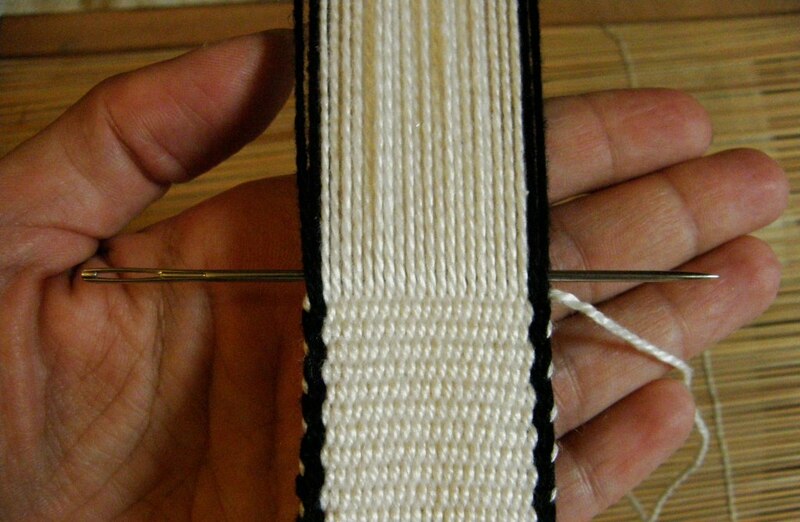 I really appreciate the hints that a beginner can use, like how to secure the woven edge using a tapestry needle. Looking forward to seeing you. Safe journey. Thanks for using the kangaroo bookmark. Unfortunately, I did not take the photo to clearly show what that bit of white yarn is doing. It is the saver cord — something that I have come to consider essential. I’m glad you showed me to use it.